Shelton 4-pc. Queen Bedroom Set w/ Storage Style and convenience are key components you’ll find in the Shelton 4-piece queen bedroom set. What immediately catches the eye is this set’s gorgeous distressed wood planking, complemented by antiqued metal hardware that enhances the rustic feel of this casual group. And thanks to the queen bed's drawers, you’ll have plenty of storage for extra clothes and blankets. Style and convenience are key components you’ll find in the Shelton 4-piece queen bedroom set. What immediately catches the eye is this set’s gorgeous distressed wood planking, complemented by antiqued metal hardware that enhances the rustic feel of this casual group. And thanks to the queen bed's drawers, you’ll have plenty of storage for extra clothes and blankets. L: 89" x W: 63.5" x H: 59"
L: 30" x W: 18.5" x H: 30"
L: 35" x W: 2" x H: 40"
i bought the bed frame, the dresser with the mirror, a night stand and the chest. It is a very nice bedroom set and delivery guys were very nice and careful! I am in love with this set. It's very sturdy and well made. very solid wood, I love how all the drawers open and close very smoothly. Very happy with how it looks and performs. We are very happy with this bedroom set. It looks great and there is lots of storage. The touch lighting on the nightstand is a little confusing. Is the Shelton server the same exact stain as the bedroom dresser? 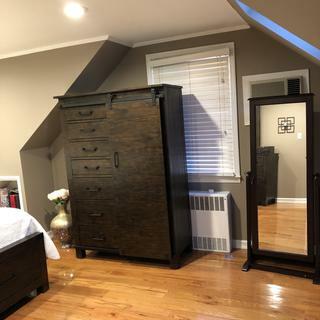 Can the server be used in the bedroom set as a dresser and match perfectly? I like the barn doors and would purchase pieces separately. BEST ANSWER: The finish on the dresser and server are the same. The pieces can all be purchased separately, and will match perfectly! What color stain is the Shelton 4 piece bedroom set? BEST ANSWER: The Shelton collection has a distressed dark pine wood finish. Do you need a piece of plywood on top of the platform/slats to support a coil mattress? BEST ANSWER: There is a slat roll of 12 wooden slats with 3 support rails so a bunkie board would not be required for the Shelton Queen Bed. BEST ANSWER: The Shelton Bed does come in a king size. Owners manual with bolt sizes? BEST ANSWER: For assistance with an owners manual and bolt sizes, please call Customer Care at 866-383-4484, option 2. What is the construction of the Shelton pieces? Are they solid wood or do they have a veneer? BEST ANSWER: The Shelton collection is made with kiln-dried pine frame material and finished with distressed wood planking. Can I order the pieces of the shelton bedroom collection separately? If so, what are the prices?